Hanoi is the country’s cultural heart, bearing traces of centuries of changing dynasties. Visit Ho Chi Minh’s house, a simple structure located among banyan and milkweed trees, which served as home to the revolutionary guerrilla leader who pursued independence for Vietnam. Continue to the lotus-shaped One Pillar Pagoda, dating back to the first Vietnamese empire independent from China. Next, visit the Temple of Literature, Hanoi’s first university. After lunch at a local restaurant, reflect at Hỏa Lò Prison, the infamous “Hanoi Hilton,” where American prisoners of war were once confined. Next, Ride Like a Local by cyclo through the Old Quarter. Later this evening, gather with your fellow guests for a welcome cocktail reception and dinner. This morning, you are transferred to the port city of Hai Phong, where you board ‘Orchid,’ the stylish vessel that is your home for the evening. Cruise into the stunningly picturesque seascape of Ha Long Bay, setting course for Da Chong islet, then watching as its century-old French colonial lighthouse drifts by. Settle into your deck chair as ‘Orchid’ snakes her way past the islets of Con Vit and Gia Luan, their striking karsts (limestone formations) rising dramatically from the tranquil bay. ‘Orchid’s’ course isolates you from the typical tourist route, winding past Thoi Quyt and Coc Ngoi islets. Disembark on Cat Ba Island and travel overland through a stunning karst landscape cloaked in verdant forests on your way to Trung Trang Cave. Admire the cave’s intricate features, formed over millennia. Step back aboard ‘Orchid’ as she maneuvers for the best vantage of a dramatic sunset framed against the Gulf of Tonkin shoreline. Join a Chef’s Table demonstration featuring traditional Vietnamese cuisine, followed by dinner on board. Retire to your cabin to enjoy a restful night’s sleep as the waves lap gently against the hull. Greet the day with sunrise tai chi overlooking the bay from ‘Orchid’s’ deck. Set out for an early morning kayak excursion among the towering limestone pinnacles. Return for brunch on board as ‘Orchid’ makes her way back to port. Disembark and board a coach for the scenic, half-day journey to Mai Chau, pausing for breaks along the way. This evening upon arrival, settle in to your accommodations, and then gather for dinner and a traditional dance performance. After a leisurely breakfast, you may opt to set out on a cycling tour of the local valleys. Your 19 kilometre ride snakes its way through Chieng Chau, Van Mai, Cun and Mai Hich, passing villages, lush rice paddies and seldom-seen countryside. En route, pause to meet a local hill tribe community and learn about their enduring cultural traditions. Then, enjoy lunch at a local home, before returning to your lodge by late afternoon with the remainder of your day at leisure. This morning, transfer to Hanoi. After lunch at a local restaurant, transfer to the airport for your flight to Hue. Upon arrival, you are transferred to your boutique hotel fronting the banks of the Perfume River. Enjoy the remainder of your evening at leisure. Today, explore the legacy of the Nguyen dynasty, a powerful family that ruled Vietnam from 1802 to 1945. Their reign witnessed the construction of Hue’s Imperial Citadel, which served as the nation’s political capital and religious hub. Venture inside it to discover the Imperial City, a walled palace that mirrors the grandeur of China’s Forbidden City. Next, explore the tomb of Emperor Tu Duc, the dynasty’s longest reigning ruler. Stroll among the citadel’s other monuments, noting the scars of war still remaining from the conflicts of the last century. After lunch at a local restaurant, return to your hotel for time at leisure. Later, hop on a Vespa for a ride to a nearby home, where you are welcomed in by a local family. Step into the family’s temple to learn more about their traditions and beliefs. Next, head to their kitchen for a Chef’s Table demonstration. Finally, gather round the table for dinner with your newfound friends. Return to your hotel with a deeper understanding of local life. After breakfast, transfer to Hoi An via the stunningly scenic Hai Van Pass. Also known as the “Cloudy Pass,” this winding mountain road overlooks lush countryside, sandy beaches and the blue waters of the South China Sea. Pause in Danang to view the Museum of Cham Sculpture’s collection of artifacts dating back to the seventh century. Continue to Hoi An for a guided culinary exploration of local street food. Sample traditional dishes from a collection of ten market stalls hand-chosen for their diverse offerings and Westerner-friendly preparations. Afterward, transfer to your hotel for an evening at leisure. Set out on a walking tour of Hoi An, a UNESCO World Heritage Site retaining a diverse mix of architecture influenced by the many nations that traded in this historic port of call. Explore the Old House of Tan Ky, the Fujian Assembly Hall and the 400-year-old covered bridge. Return to your resort for an afternoon at leisure. Later, gather for a Scenic Sundowner on the beach, watching as the warm glow of twilight paints the sky over the palms. 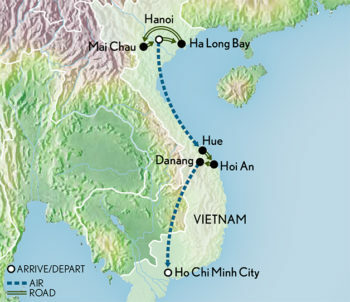 Fly this morning to Ho Chi Minh City, formerly known as Saigon. Recently experiencing a resurgence of art and culture, this lively, evocative city is a hub of activity — a sharp contrast to the traditional ambience of Hanoi. Later, view examples of the city’s colonial legacy, including the Central Post Office, the Opera House and the Notre Dame Cathedral. Tonight, enjoy dinner at your hotel. This morning, travel out of the city and into the countryside to explore the expansive Cu Chi Tunnel network, a key Vietcong resource during the Vietnam War. You have the opportunity to squeeze into and crawl through the small tunnels once traversed by Vietcong guerrillas. Enjoy lunch at a local restaurant, and then visit the War Remnants Museum. After some time at leisure, gather at a culinary hotspot for a cocktail reception and farewell dinner.